This page explains what software to install and what you need to know and configure in order to play video DVDs using Red Hat Linux. As often with Free Software, there a various alternatives to choose from, which is why you'll find quick descriptions to hopefully help you in your choice. I still recommend trying all possibilites, especially if a DVD doesn't work with your usual program, it may very well work with another! Make the change current using "hdparm -d 1 /dev/dvd" (If you are using IDE-SCSI emulation and /dev/dvd points to the SCSI device, you will need to use the original /dev/hdX instead). Make the change permanent by adding a line containing "options ide-cd dma=1" to your /etc/modules.conf file (Red Hat Linux 8.0 and higher). Make the change permanent by copying /etc/sysconfig/harddisks as /etc/sysconfig/harddiskhdX (where X is the letter corresponding to your device) and uncomment the "USE_DMA=1" line (Red Hat Linux 7.3 and earlier). Ogle is by far the most simple to install and to use, as unlike most others, it's designed to be a software DVD player and nothing more. It fully supports menus, most sound formats (including PCM but not DTS), and is ALSA compatible. Its goal is simplicity and it achieves it quite well. Won't work without a /dev/dvd entry, but it's created by default as a symlink to /dev/cdrom by recent Ogle packages. You can change the configuration as a user, just copy /usr/share/ogle/oglerc as ~/.oglerc and edit to suit your needs (see the oglerc(5) man page for more). Interesting changes include using ALSA instead of OSS by default, and having the playback start in full screen. MPlayer is a versatile movie player. Its DVD features do not yet include menu support, but as a very mature player it has advanced and useful video processing options. The deinterlacing it offers works great on "TV-like" interlaced streams (usually trailers, documentaries or DVDs of TV programs). To launch a DVD, you must run "mplayer -dvd <title id>", see the mplayer(1) man page for more. Won't work without a /dev/dvd entry or specifying the "-dvd-device <device>" option. To launch MPlayer with its GUI, simply run "gmplayer" instead of plain "mplayer". Deinterlacing can be obtained with the "-vop pp=lb" option. Example command line for mplayer : "mplayer -fs -vop pp=lb -dvd 1". 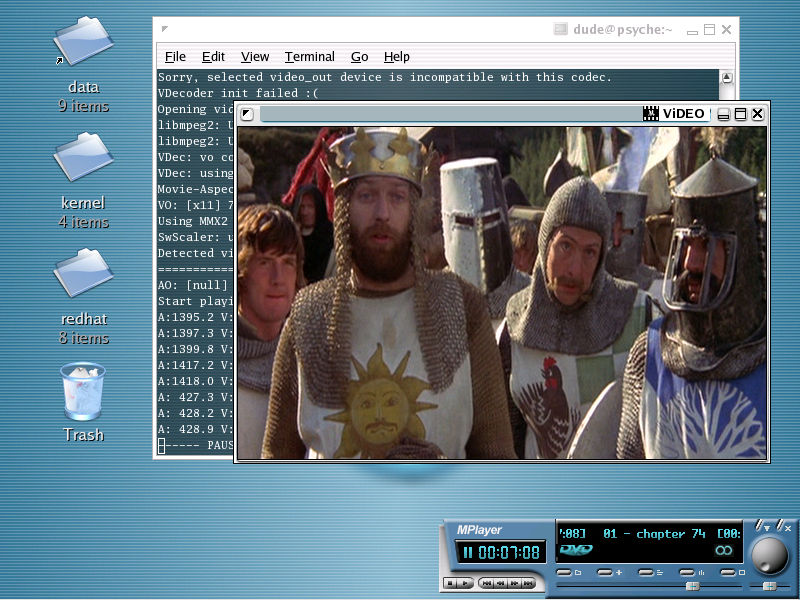 Xine is a versatile movie player just like MPlayer, it even offers some neat visual effects for audio-only streams. Its DVD features are very advanced and very well integrated in its GUI. It fully supports menus. Won't work without a /dev/dvd entry pointing to the right device.